← Volunteer to be an SAA mentor! Yeah, I’m talking to ***you***!! Not so impressive is it? Help improve our sorry collective voting record and help get out the vote! Especially your own. Thanks to this year’s Nominating Committee, the slate of candidates is both excellent and varied in terms of background, expertise, and all other meaningful variables. And if you want to hear more from them, take a look at the statements from some of the candidates that have been appearing on the SNAP blog (this link is to the latest of these posts–cruise around the blog for earlier ones). 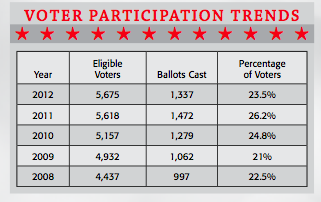 Note: The voter participation table was published on page 15 of the May/June 2012 issue of Archival Outlook. This entry was posted in Member Needs and tagged candidates, election, vote. Bookmark the permalink. Hi, Eira– I have no idea whether SAA retains voting data that would link a member’s profile (e.g. date they joined) to voting record. The count of votes cast is of course very easily obtained. If you’d like to let me know more about the sort of data that you believe would be valuable, I’d be glad to hear about it.